Binoculars are an excellent tool for watching birds. They are quite useful in giving you hints about lots of birds that are at a long distance from you. You’ll be surprised at how much use the spotting scope is for watching the distant birds. You can find more species of birds, and can easily identify the little marks on shorebirds, a lot of distant waterfowls, and hawks which cannot be seen with binoculars. You’ll love the minute details of the plumage which you have never seen before. It will be a blessing if you’ve got a nice digital camera or a smartphone because that will help you enjoy digiscoping. Just like binoculars, spotting scopes come with a lot of different design characteristics and optics to consider when you’re thinking of investing in a good spotting scope. In this blog, you can learn about the most important things here, and will also get some great tips which will help you know how to choose a spotting scope for target shooting. And there’s one essential tip for you right now: never ever use a telescope that’s made for astronomy to watch birds. The magnification is extremely high, and most of the times they are not weather resistant. 1 How to Choose a Spotting Scope? 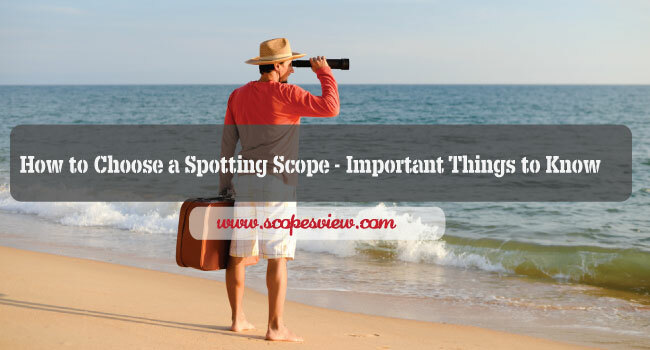 Bellow the some important things to choose a best spotting scopes. Let’s see. Spotting scopes are considered as a medium-range telescope, and they have a magnification power of about 15 to 60x. You can also change the magnification power by changing the eyepieces or tweaking it. You should always go for an eyepiece that is low-power or use the setting that is lowest on the zoom eyepiece while you’re scanning an area. For example, go for the 20 to 30 times range. Change it to a higher power after locating the birds which you would like to observe more closely. When it comes to the zoom lenses change, the magnification power will vary from about twenty times to as much as sixty times with a small and easy adjustment. These are a great option for watching birds because it will allow you to scan conveniently at a low power. You can also tweak it to greater power quickly if you want to focus on more details. But camera lenses and zoom lenses won’t gather much light if compared to fixed lenses. Moreover, as the power of magnification increases, it will have a bad impact on binocular because they will face the problem of less light and narrower view, and extreme vibration. There was a time when it was difficult to find a good enough zoom lens, and its costs were huge. Nowadays, you can find some great options in mid-range scopes which have great zoom lenses. These come with an extremely high power, good quality zooms provide sharp images and excellent clarity. Therefore, you should always look for the best quality scope which you can pay for. There are a lot of different types of glasses with which the best spotting scopes are made of. These include HD or high-density glass, ED or extra-low dispersion glass, and fluorite coated glass. You can easily notice the difference between high-quality glass and standard glass. There is a noticeable difference in the image clarity and brightness between the best scopes and those which are made of standard glass at a very high power. My recommendation is to always go with the high quality and expensive glass type. Just like binoculars, a spotting scope’s capacity of light gathering is determined by objective lens size. Based on the kind of model you use, this will usually vary between 50 to 100 mm. Remember that bigger objective lenses can ensure brighter and clearer images but scopes will be heavier and it will be difficult to pack it in luggage. One more important factor to consider when you are choosing a spotting scope is the placement of eyepiece. There are some models which have eyepieces specifically made for ST (straight through) viewing, and this makes it more convenient to find and go after the subject easily. This seems natural, but a lot of bird watchers prefer a forty-five degree angled one. That is a kind of style which will make viewing on top of horizon easier, and will easily work with smaller tripods (and that is definitely stable), and will also make your hobby much more fun when you’re with a lot of people. Those who wear eyeglasses should definitely focus a lot on the kind of eye relief given by a particular scope. When it comes to greater eye relief, it pushes the focal point further back at the back of the eyepiece so that the person using it can enjoy a complete picture. Relief for eyes is usually measured in millimeters. It is usually 12 to 15 mm of relief which is sufficient for those who wear eyeglasses. For spotting scopes, focusing mechanism is usually handled in either of two different ways. The first method is to use a focusing collar using which the barrel is rubberized or knurled and you can twist the barrel to sharpen the image. The other method mainly involves using a slightly smaller focus knob on scope’s top close to the eyepiece. They are a little slow but specialize in precise focusing. If you have decided to use an eyepiece that is fixed, always go for a device that’s 20 to 60x. This is mainly recommended for general birding. This is important because of distortion by heat and the light-loss caused by it. You should never ever choose the eyepieces that have a focal length which is fixed and those that are bigger than 45x, except when you are getting a really good quality. Tips: Here is our top 10 list of spotting scopes and buying guide. You may check this. Many bird watchers look for a high variability from their zoom lens. You can also find trendy, mid-range scopes with very good zoom lenses. Don’t compromise with the quality of zoom lenses because they have less light. They are not a great option for viewing. You should always go for the objective lens which has a minimum of 60 mm of the diameter so that you can ensure a clearer and bright image. Use a good quality tripod which is not only rigid but sturdy with leg adjustments. Now you must have learned how to choose a spotting scope.